The speed of sound in the ocean varies with depth, but with a twist. And in that twist the United States Navy held a three decade technical lead in submarine detection. The scenario, below, presents a case where a submarine is emitting a sound. It is immersed in a liquid that is layered with denser water above and below a region known as the SOFAR Channel. The submarine is in the top, dense layer. 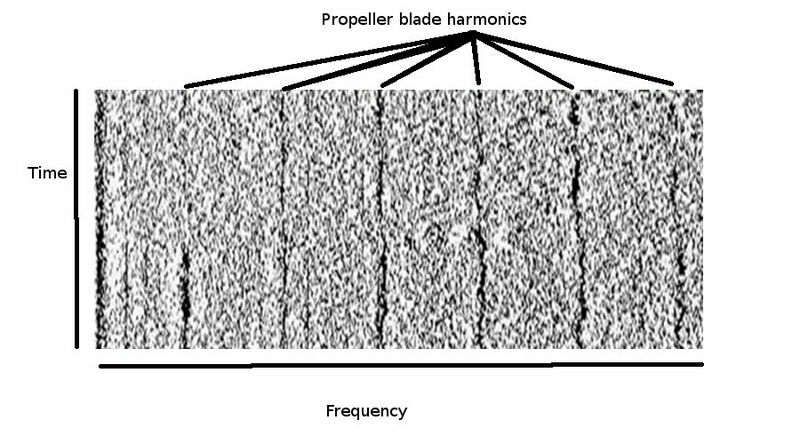 Within the graphic, the SOFAR Channel is the light blue layer with the converging strong lines of sound from the submarine. Note the shape of the lines are not straight lines. They bend due to the variation in water density like a lens. Within this channel, sound will propagate with far less attenuation (fading), and travel many hundreds of miles to remote detectors. There are a number of dashed rays of sound that encounter loss in reflection from the bottom, or are situated along a path that does not lead into the interior of the SOFAR Channel. 200 eighty-foot towers laid down the side of Plantagenet Bank in Bermuda. 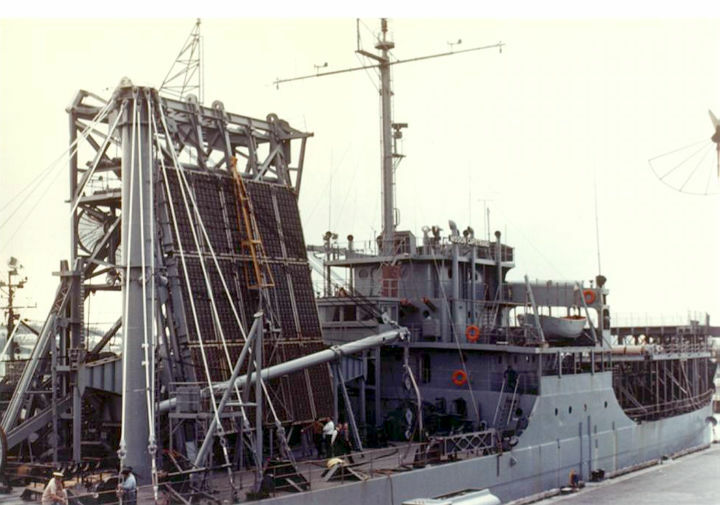 The strings were laid on the side of the bank using the U.S. Navy large covered lighter YFNB-12, reconfigured with a long overhead boom to handle the towers. Each cable had special takeouts built into it at intervals from which wires to the hydrophones were connected. Each tower was clamped onto the special cable with takeouts. At the upper end of the approximately 4-inch (100 mm) cable a wire rope was attached and led to an explosively embedded anchor shot into the flat coral top of Plantagenet Bank. Tension of more than 40,000 lb was applied to the wire rope and cable to lay it down the side of the bank in the straightest line possible. At one point all further construction ceased while a stopper was placed on the special cable because most of the connection to the wire rope had broken and the string was being held by a few strands of wire on the double drum winch on YFNB-12. The YFNB-12 was held in place with four Murray and Tregurtha Diesel outboard engines placed on the corners and capable of 360 degree rotation, developing tremendous thrust in any direction. 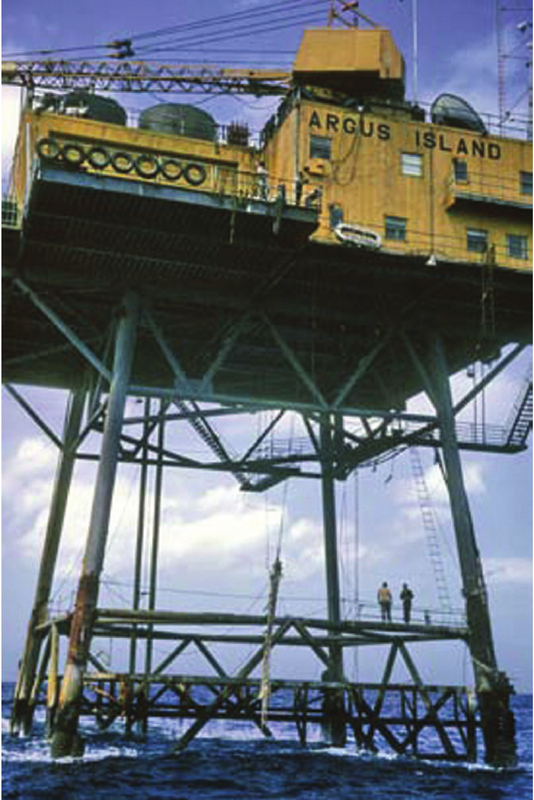 The cables led to Argus Island tower, from which the signal was conducted to the United States listening post located at Tudor Hill, Southampton, Bermuda (32.264122°N 64.877666°W) that had opened on June 1, 1955. At the time the post was classified top secret. 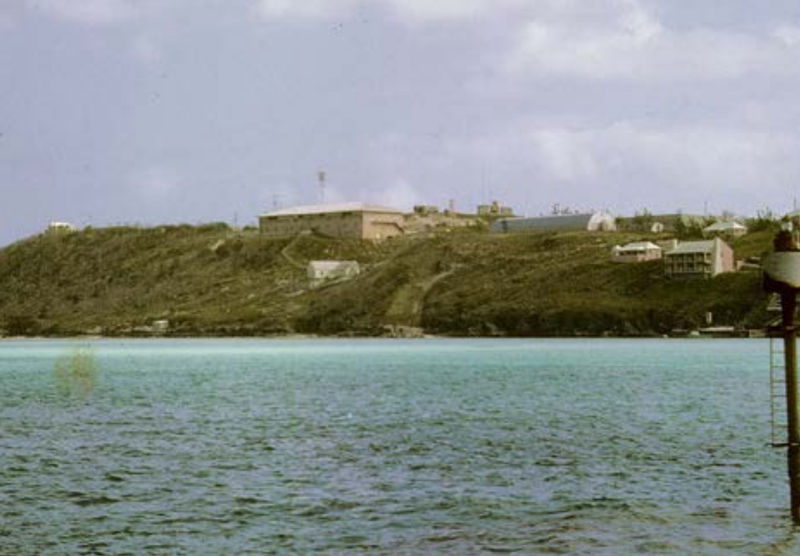 Tudor Hill Naval Facility Bermuda was closed in 1995. 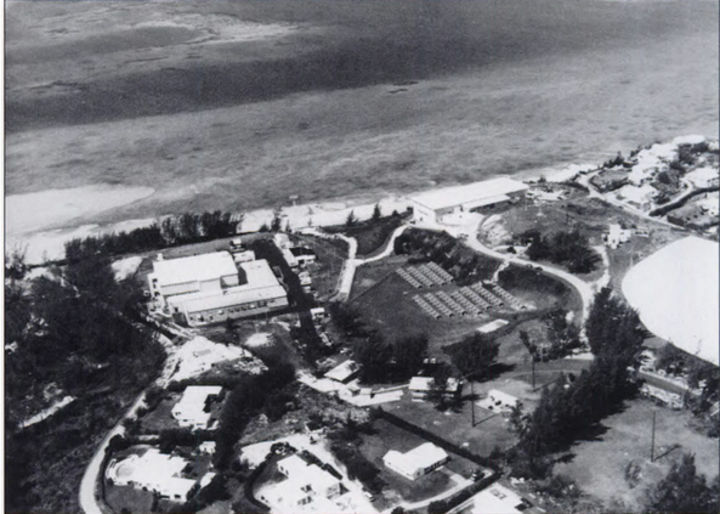 The facility shares a short road with the Pompano Beach Club. Picture of the probable interim design. Picture of the probable final design. These two views may not be with the same hydrophone array. The second is obviously larger than the first. Given the resolution’s rough ability to count the elements, this makes for difficulty in determining their construction details. Focusing on the second, my first impression was to call each white spot in the field of frames an element. 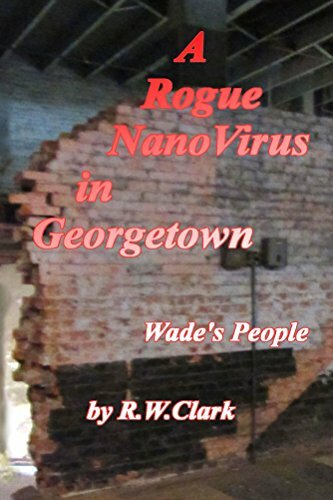 However, there are white square covers over some of what should be elements (I would speculate they were there to mark what element had not been inspected yet—or had failed a test), and these covers center on the black areas surrounding the white areas. Thus the white areas are part of the frame. The first picture’s array is in 3×5 panels, each panel is of 5×12 elements (900 total elements), but this does not conform to the specification above in any way—even if additional panels were added. However, as this is a difficult interpretation given both the poor resolution and the camera angle, each panel could be composed of 6×12 elements, and the entire assembly is only short a row of panels. 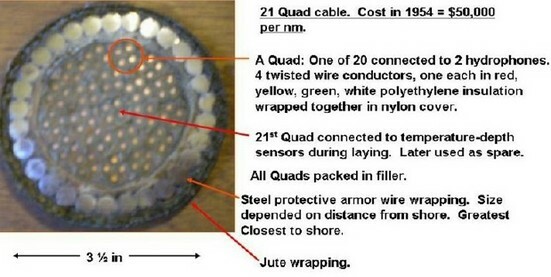 I would like to think this first picture is displaying the array under partial construction. The Artemis acoustic source was designed to meet the requirements for an ocean surveillance study program. These requirements included a source level of 152 dB in a 100-Hz band centered at 400 Hz with a transducer operating depth of 1200 feet. 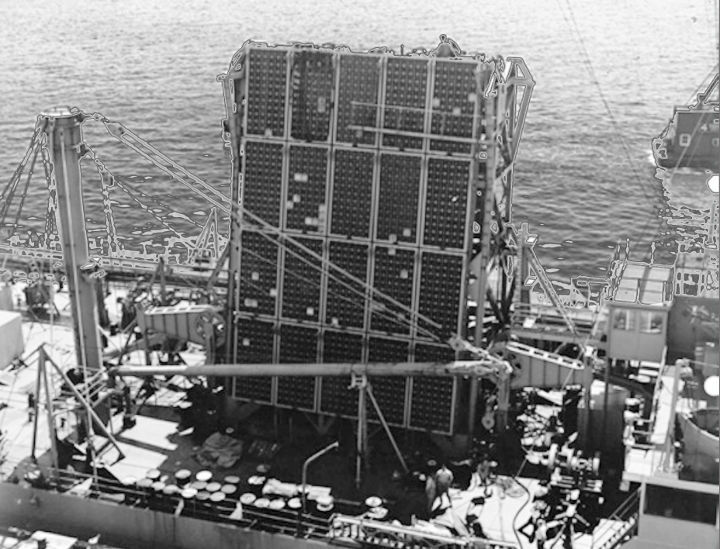 The transducer, which was completed in June 1964, is a rectangular planar array 33 feet wide and 50 feet high. 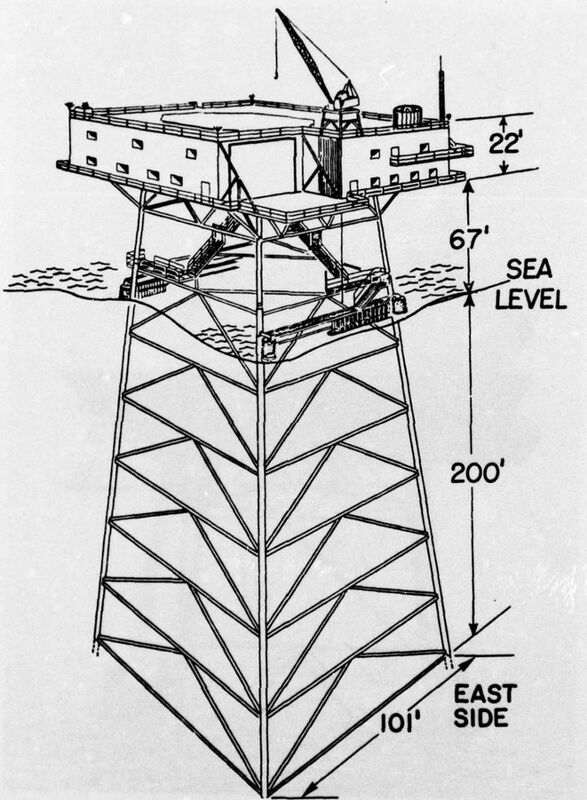 The ocean surveillance study program, Project Artemis, initiated by the Office of Naval Research in 1958, required a very high power, deep acoustic source. The acoustic requirements established. for the projector called for a capability of radiating 1000 kW of acoustic power in a 100-Hz band centered at 400 Hz with pulse lengths of 10 to 60 seconds at a 10% duty cycle. Beamwidth to the half-power points was to be 20 degrees in the horizontal plane and 12.5 degrees in the vertical plane. 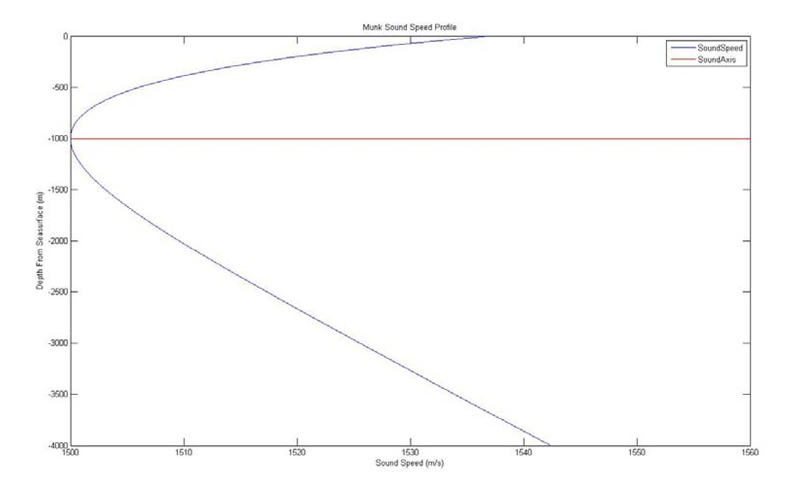 This combination of power and beamwidth would result in a source level of approximately 152 decibels relative to 1 microbar at 1 yard (dB//1 gbar at 1 yd). The acoustic axis was to have a fixed orientation of 11 degrees above the horizontal plane. 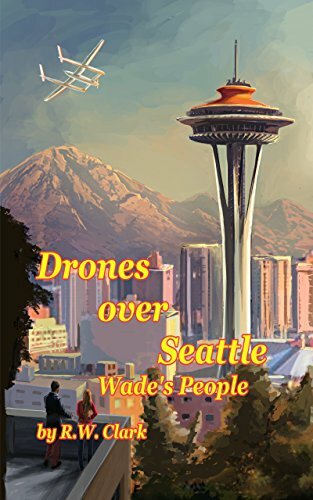 Several proposals for the projector were considered, the final selection being a rectangular plane array 33 feet wide by 50 feet high composed of 1440 variable-reluctance transducer elements. Each element is nearly cubical, being 11-1/8 inches square on the radiating face and 11-3/4 inches deep. They are assembled in frames in which 72 elements are closely packed in 12 rows by six columns. Each assembly, referred to as a module, is approximately 6 feet wide. by 12 feet high. The completed array consists of far rows of modules with five modules in each row. The modules are mounted on a suitable array frame which provides the proper tilt angle of the radiating face and supports auxiliary components associated with the electrical input to the elements. Radiation to the rear of the array is suppressed by a system of pressure compensated, flattened, gas-filled tubes which serve as acoustic pressure releases on the rear faces of the elements. The present configuration of the ARTEMIS source employs TR-11C elements with a parallel electrical connection of groups of six series connected elements. (source unknown) The SOSUS application of these elements in an array suggest a receive sensitivity of 1W audio power at 1,000km. Robert A. Frosch, in his capacity as Technical Director of Hudson Laboratories (Columbia University), was technical director of Project Artemis. The RV Erline in transit between Argus Island and Tudor Hill Laboratories. A view of Tudor Hill Laboratories’ listening post at the crown of the hill (a very common siting arrangement). One of the cables in a SOFAR installation. This shows the tapering of the line between the sea deployment of SOSUS hydrophones the Terminal Building where the leads are terminated into audio filters, storage, time shifters (delay lines built into the storage), and finally verniers (chart recorders) that make LOFARgrams. 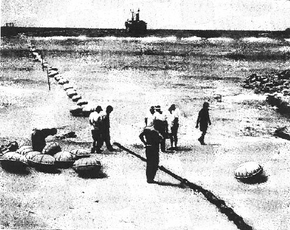 SOSUS cable being laid out to sea. And, of course, the cable has to emerge somewhere along a beach. 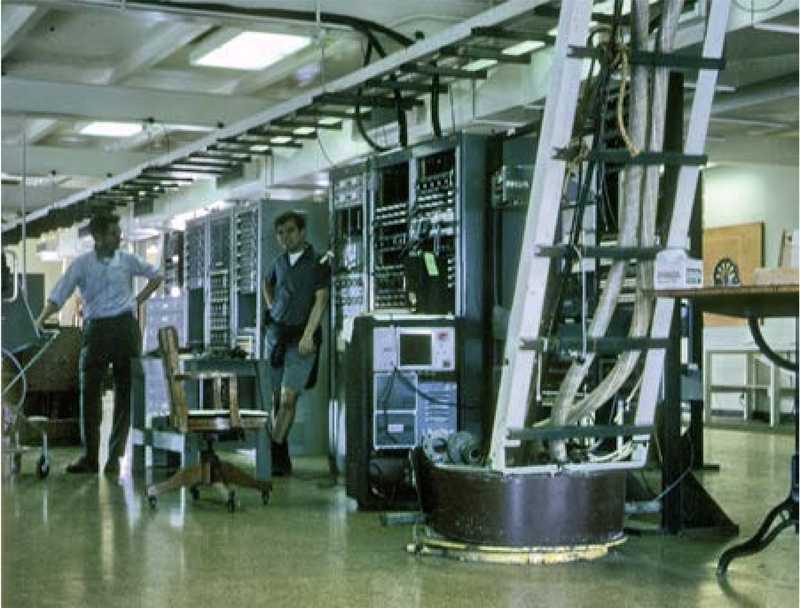 At this point I need to point out that the beach picture with cable, and earlier pictures are presenting the common design considerations for nearly any SOSUS station, but not for NavFac Bermuda which received data through RF transmissions from Argus Island. Still, audio is audio, and the many Verniers (chart recorders) at Tudor Hill Laboratories operated the same irrespective of this link. Aerial view of NavFac Bermuda, Tudor Hill Laboratories. The floor’s stuffing tube contains a slanted, vertical cable tray. Significant are the two 100mm cables that go to the two arrays. This presents how the calls of the Humback whale would appear in modern SOSUS technology displays. 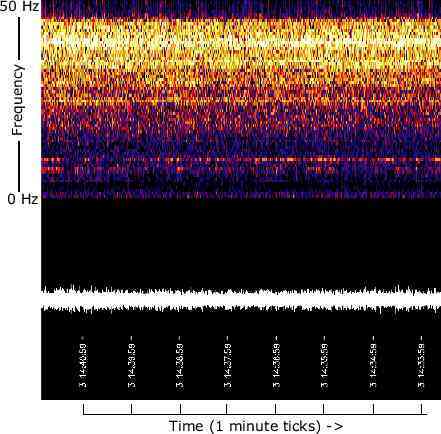 The top reveals a wider frequency range than is normally observed in SOSUS operation, but that is because it has been sped up by a factor of ten to allow the calls (normally sub-sonic) to be heard in sound recordings. This, then, suggests that the LOFARgram is not of live data, but of a sped-up recording. 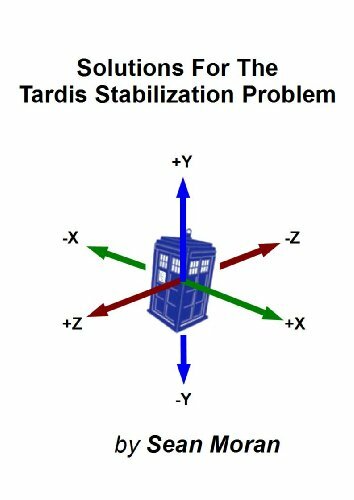 If you apply a divide by ten to the left scale, we are back to the conventional LOFARgram display covering from 0 Hz to 50 Hz. SOSUS technologists saw these waveforms for years, and were unable to determine their origin. Further complicating matters were that these noises moved. Because the early stages of SOSUS was called Project Jezebel, these noises were tongue-in-cheek attributed to the Jezebel monster. These are views of Argus Island taken from the official report of its destruction. One supervisor , electronic technician. Two senior electronic technicians (both with broad qualifications including commications and digital circuits). Two diesel mechanics/diesel-electrical , welding, plumbing and crane operator. Argus Island also hosted non-SOSUS research (to aid in its cover story of being the equivalent of a benign weather station). Among those activities was SeaLab in 1964. 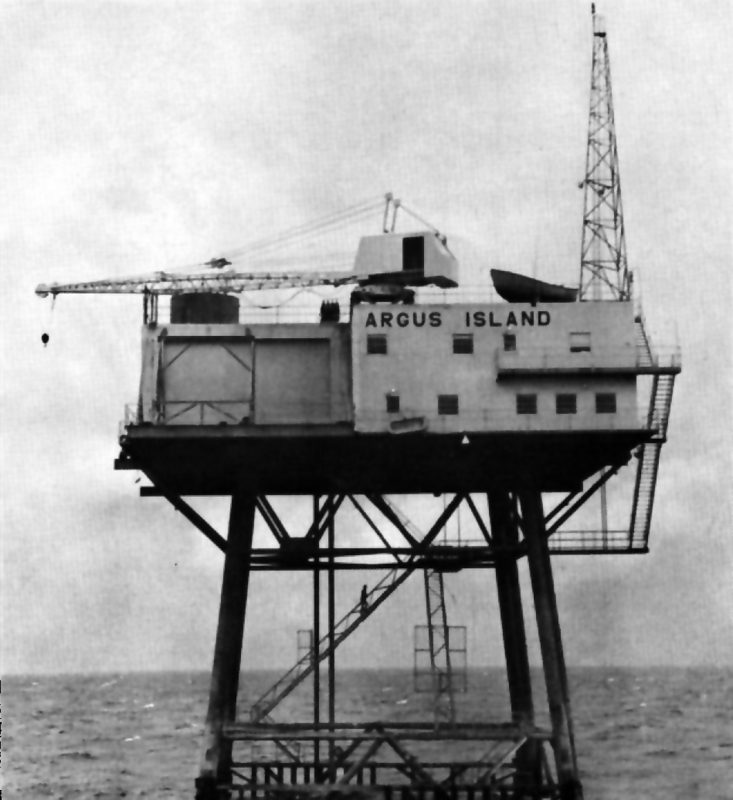 Argus Bank (more properly known as Plantagenet Bank) is a submerged sea mountain that supports the man-made Argus Island (offshore platform, also called a Texas Tower). 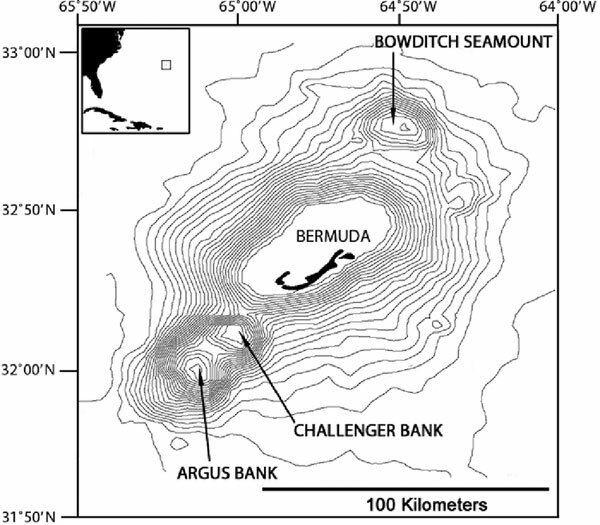 Argus Island is a SOSUS transmission line transfer point between the underwater sensors along Plantagenet Bank and the listening post located in Tudor Hill Laboratories (at the south edge of Bermuda island). Transportation of men and supplies was done between Tudor Hill Laboratories and Argus Island via R/V Erline. Argus Bank had hosted the earlier Project Argus which employed a 1MW 400Hz SONAR. Aside from the active transmitter, much of that technology is similar. The three seamounts are volcanic remnants from continental drift over a magmatic hot-spot. Individual Naval Facilities for monitoring ocean traffic approaching the United States. 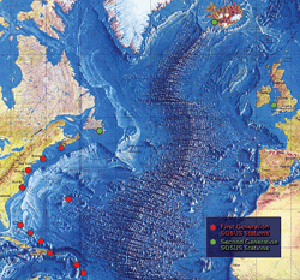 This map displays SOSUS Atlantic listening stations lining the continental shelf of the United States. Their mission was to detect and track submarines in the Atlantic ocean. The SOSUS listening stations are located on coastal land. Their underwater hydrophone sensors are many miles out at sea (80 miles or more), and often half a mile deep in the ocean’s bottom or on the edge of the shelf (or island’s seamount in the case of Bermuda).